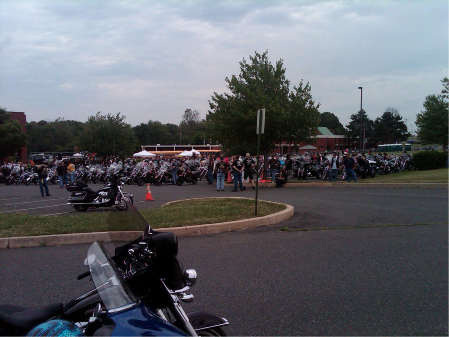 » SEPA: Ride for Freedom, 2010 Warriors' Watch Riders: WE HAVE YOUR BACKS AT HOME! On June 6th 2010, the 66th anniversary of the D-Day landings, 14 members of Warriors Watch Riders met in order to attend the annual Friends of the Forgotten “Ride for Freedom”. 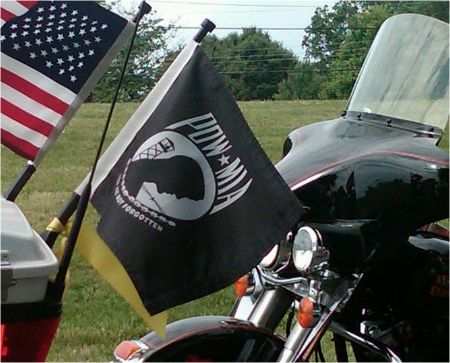 Since 1989 the “Ride for Freedom” has been held in order to keep POW/MIA issues in the public eye, to educate and to keep the spirit of the POW/MIA movement alive. 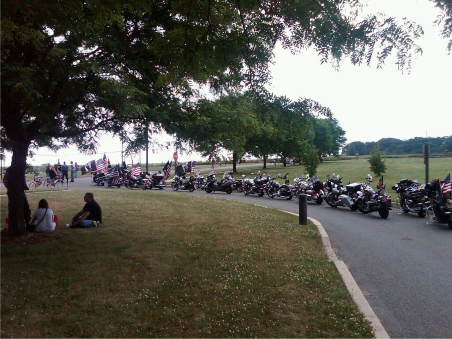 For those not familiar with the event the “Ride for Freedom” is motorcycle-only event comprised of a few main components – the marshalling of a few thousand bikes, a brief presentation, a comfortable escorted ride [through Norristown, Conshohocken, down Route 76 and into Valley Forge Park] and a longer presentation featuring speeches from a variety of guests. The event ends with the reading of the names, the Last Patrol and the playing of Taps. After enjoying the morning sun, clouds, wind and heat we mounted up at 0930 for a 15 minute ride to Whitehall Elementary School in order to meet up with other event participants. We arrived on site and were directed to park just behind the Friends of the Forgotten, who would be leading the ride. Given that there would be many groups at the event we all appreciated how the FotF made sure we were taken care of as parking would be at a premium and that we would have a place at the front of the procession. After dismounting FotF volunteers approached us in order to give us yellow ribbons and stickers for our bikes. After placing the ribbons we went to the main site in order to sample the vendors, take a look at patches and t-shirts as well as to sample the water ice used to fight back the heat and humidity. Due to an event at the High School this year instead of a single large High School parking lot there were multiple lots, each with its own fire truck and American flag, surrounding the Elementary school. As we stood and looked around hundreds of bikes entered the parking areas, filling them to capacity. Over the loudspeakers, amid the announcements, we were informed that among those attending was one of the remaining survivors of the attack on Pearl Harbor and 6 years of active duty in the South Pacific. At around 1030 the speakers started, most notably our own Wayne Lutz. Wayne’s remarks struck a chord with many there as he reflected on the fact that during the memorial day holiday the Philadelphia National Cemetery – established in 1862 the final resting place of (2) MOH recipients and 66 Buffalo Soldiers, the Mexican War and Confederate Soldiers and Sailors Monuments – was attended by zero visitors, with no Flag or other ceremonies. The point was that over time it is too easy to forget and that those assembled would have to work to ensure that they passed their lessons onto the next generation to ensure that the POW/MIA cause ignited during the Vietnam era continued its watch into the future, uninterrupted. At 1130 the call to saddle up was made and we started on the route following directly behind the FotF riders in the lead. As with every year the bikes enter the roadway two by two and form a line as far as the eye can see. Hearts swell as people line the roadways with their families, children and American flags of all kinds to show their patriotism and respect for those assembled and their cause. As we make our way through Norristown and Conshohocken honking and waving it’s finally time to get onto Route 76 and into Valley Forge National Park where we would all park near the Visitors center. Once on site the National Anthem was sung as was “God Bless the USA” in memory of William “Stretch” Smaltz, an ardent supporter of POW/MIA issues. Colors presented by the Lower Providence Police (in their blue wool uniforms) were retired. Following remarks from a US Congressman and a Senator Gold Star Mother Mary Conboy spoke about her experiences and support for the POW/MIA movement, our own FeFe read a poem on behalf of a speaker who could not attend and Col. Ward Nickisch, U.S. Army Retired, formerly the director of Casualty and Memorial Affairs (now part of Joint POW/MIA Accounting Command) spoke of his experiences and the successes of the men and women working to bring all of our heroes home again. As the event drew to a close a Marine detail held a flag folding ceremony for all those in attendance. This flag was later presented to a Gold Star Mother attending the event. The names of those still missing were read by a number of people including one attendee whose brother was lost during WWII and has never returned. His family still waits. 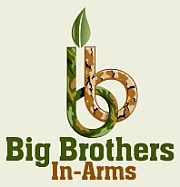 As one, after each name and branch of service is read, we all repeat “Still missing”. Smoke was popped for the Last Patrol as “Taps” was played, eliciting tears from many of those assembled. The event was closed with a few final remarks and the playing of “Amazing Grace” by Piper. While leaving the field you recognize that the POW/MIA movement, which 40 years ago lead to the creation of the POW/MIA flag later recognized by the Congress as a National Symbol “…resolving the fates of Americans still prisoner, missing and unaccounted for…” was a truly ground breaking one. While America still searches for its missing the potential is that hundreds and even thousands of lives may be changed in a moment – even if that moment stretches over generations, even if that generation is unaware of the efforts that lead to that change. In the years to come attend the Ride for Freedom and events like it in order to keep the spirit and movement alive, to ensure that no one – and the places they now rest – is forgotten and that future generations are educated and impassioned to continue fighting for our POW and MIA. No user commented in " SEPA: Ride for Freedom, 2010 "